Once again, Juicy Stakes Poker should buy themselves a plane, they've been flying so many online players to the Caribbean for live tournaments! Another player has just won an online satellite tournament winner and is off to the Caribbean to soak up some sun and compete in a live $200K GTD poker tournament. The $3500 prize package includes buy-in to the CPPT Main Event in St. Maarten April 30 to May 3, 2015. The Juicy Stakes online satellite winner and a guest will live it up at the Sonesta Maho Beach Resort for five nights. First and second step online satellite tournaments have just begun and continue until January 24th at Juicy Stakes Poker. The Final, where the $3500 prize package will be awarded, is on January 25th. The CPPT III St Maarten Caribbean poker tournament is offers ten days of Hold’em and Omaha with buy-ins from $100 +$25 to $330 + $40. The Main Events are the $1650 No-Limit Hold'em $200K GTD that the Juicy Stakes winner will play in and a $3200 + $300 No Limit Hold’em tournament. Register for Juicy Stakes' CPPT Satellite Tournaments under the Tournaments tab in the poker software. Oh ya, almost forgot to mention! 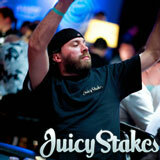 You can get a $100 New Years Reload Bonus at Juicy Stakes until this weekend. Your deposits up to $100 doubled if you use bonus code JANUARY2015.